J. Michael “Mickey” Robertson is a Virginia native living now at Lake Monticello. He has served three churches, but has fallen in love with his Elk Creek congregation at Lake Anna. At other times he has taught at several colleges, and coached college baseball for nine years, fulfilling a long-time dream. His B.A. is from Virginia Commonwealth University, his M.A. and Ph.D. from the University of Virginia, and his M.Div. from Baptist Theological Seminary at Richmond. He has pursued additional educational opportunities at the University of Richmond and the International School for Holocaust Studies, Yad Vashem, Jerusalem. He is preparing to teach at BTSR in 2019. 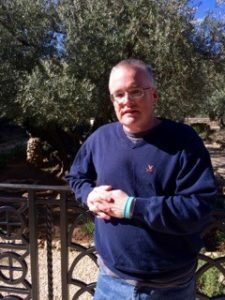 Hobbies include reading, the MLB Baseball package, and travel, leading his first tour of Israel in October 2018, and on a preaching and teaching trip through Romania, Turkey, and Bosnia in September 2018. He and his wife Pam (Mingea), a critical coronary care nurse at the University of Virginia Hospital, have three children, Erin, David, and Catie, Lucy and Dakota (cats), and a terrier-plus something named Max.